One of the world leaders in 3-alkylpolythiophenes and P3HT, Rieke Metals' polymer division is unique in the range of compounds offered. Our polymer list includes water soluble polythiophenes, 3-thioalkyl polythiophenes and regiorandom polythiophenes. We provide many different types of P3HT for research and commercialization and a special 25%-25%-25%-25% regiorandom P3HT. Our newest grade of P3HT, RMI-001E/EE, has a regioregularity of 96% or above. 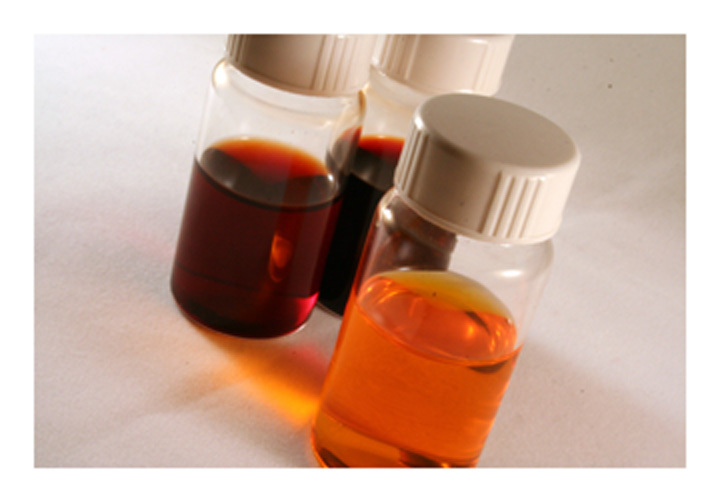 All the polymers are characterized by high regioregularity and reproducibility. The monomer list has also been expanded and includes 2,5-dibromo-3-alkylthiophene in addition to many other substituted monomers. We are proud to list the below article published in Nature. Published on November 9, this paper's research was done using Rieke Metals' P3HT. These semi-conducting polymers are useful for, but not limited to, printed electronics, OLED's, RFID tags and photovoltaic cells (solar cells). For more information on the uses of P3HT, see our "References" page. Rieke Metals offers several classes of specialty semi-conducting polymers. Please contact us for P3HT batch specific information. We have batches that range from 36K to 90K via GPC. All batches are priced the same. Please contact us for specific batch information. P3HT is not soluble in protic solutions, such as alcohols. It is most soluble in chlorinated hydrocarbons such as chloroform, methylene chloride and carbon tetrachloride. P3HT is reasonably soluble in THF and also aromatic hydrocarbon solvents such as toluene and xylene. The regiorandom version is more soluble than the regioregular versions. Please feel free to contact us about specific P3HT solubility questions. Alkyl = butyl, octyl, decyl, and docecyl. These polymers are not soluble in protic solutions, such as alcohols. They are most soluble in chlorinated hydrocarbons such as chloroform, methylene chloride and carbon tetrachloride. They are reasonably soluble in THF and also aromatic hydrocarbon solvents such as toluene and xylene. The solubility differs with the 3-alkyl group chain length, the butyl being the least soluble and the dodecyl being the most soluble. The regiorandom versions are more soluble than the regioregular versions. Please feel free to contact us about specific solubility questions. These polymers are most soluble in water. These polymers are the most soluble in tetrabutylammonium hydroxide and NMP. They are slightly soluble in other solvents as well, such as DMSO and DMF. Please contact us for specific solubility questions.